John Cena made his feature film debut with 2006's "The Marine," a dumb-as-rocks actioner lacking sufficient style and kinetic energy to help digest its rancid helpings of explosions and ghastly screenwriting. It certainly played to the primary color level of a professional-wrestler-turned-actor like Cena, but the whole experience was intolerable, failing to join the ranks of the numbing, trigger-happy schlock cinema it was aping. "12 Rounds" returns Cena to the big screen and this time under the guidance of director Renny Harlin, a tattered but venerable action craftsman who knows a thing or two about hokey line readings and fireball evasion. 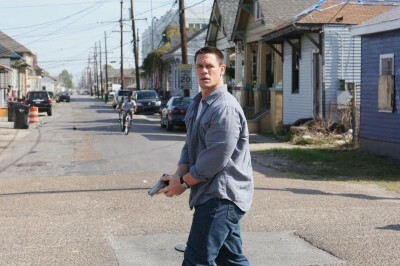 When a FBI sting to capture notorious Irish terrorist Miles Jackson (Aidan Gillen, "The Wire") goes horribly wrong, New Orleans cop Danny Fisher (John Cena) is caught in the middle, accidently sending Jackson's girlfriend to her death during the melee. A year later, Jackson has busted out of prison and kidnapped Danny's wife (Ashley Scott), setting up a twisted game where the detective must survive 12 violent challenges to retrieve his loved one. Quickly mired in the series of lethal situations, Danny finds little help from vengeful FBI agents (including Steve Harris), leaving his raw police skills and love for his wife as his guide to navigating this twisted contest. Actually, it turns out Harlin is absolutely no help here. Let's get the obvious out of the way early: "12 Rounds" is implausible, wretchedly scripted junk food that cares more about bursting the limits of absurdity than it does about telling an engaging action story. Of course the film is garbage. With wrestling powerhouse WWE producing, chances are the statement, "Guys, this just doesn't make any sense," never came up during a script meeting. I can't fault "12 Rounds" for being dumb. However, I will criticize "12 Rounds" for being awful. Even as a cheesy, blow-em-up distraction of the lowest possible order, "12 Rounds" fails to capture the same deliciously machismo orchestrations the Schwarzeneggers and Stallones of the world used to churn out by the bucket load. Most of the fault lies with Harlin; it's a cruelly agitated directorial job fixated on a specific zoom-laden chaos that plunges the audience into the middle of the madness along with Danny. I view it more as a cheap ploy to generate a false sense of excitement to cover the ridiculous screenplay, but Harlin seems assured that continuous camera movement equals surefire stimulation. Hey, if it keeps the focus off of Cena's wooden acting, I'm all for it. Still, it doesn't take long for the visual toxicity to become unbearable. "12 Rounds" is a stunt-happy picture, and that's the one element I feel comfortable praising. Structured litigiously like "Die Hard with a Vengeance," "12 Rounds" rarely stops to breathe, always on the hunt for a dilapidated New Orleans location to blow up or to find a fresh way for Danny to barely escape assured doom. The titular games permit Harlin a chance to concoct a few compelling action set-pieces, all of them swiftly ruined by the camerawork, the dialogue, and the acting. "12 Rounds" is about bigness and furious action beats, and for a few moments here and there it feels like the Renny Harlin of old has returned. The sensation is fleeting, especially when Cena, Harris, and Gillen feel they must open their mouths and kill the tension with words. That's what "12 Rounds" needed less of: words. After two movies, I still don't spot a single reason John Cena should be a movie star. He's virtually free of charisma, and to find stunning actors that would make him appear gifted would require more money than what the WWE is willing to part with. "12 Rounds" is the second strike on his celluloid career. If Cena's not careful, one more of these stinkers and it's nothing but DTV potboilers with Hulk Hogan.